Tornadoes occur in many parts of the world, including Australia, Europe, Africa, Asia, and South America. Even New Zealand reports about 20 tornadoes each year. Two of the highest concentrations of tornadoes outside the U.S. are Argentina and Bangladesh. Both have similar topography with mountains helping catch low-level moisture from over Brazil (Argentina) or from the Indian Ocean (Bangladesh). About 1,000 tornadoes hit the U.S. yearly. Since official tornado records only date back to 1950, we do not know the actual average number of tornadoes that occur each year. Plus, tornado spotting and reporting methods have changed a lot over the last several decades. Tornado season usually refers to the time of year where the U.S. sees the most tornadoes. The peak “tornado season” for the southern plains -- often referred to as Tornado Alley -- is during May into early June. On the Gulf coast, it is earlier during the spring. In the northern plains and upper Midwest, tornado season is in June or July. But, remember, tornadoes can happen at any time of year. 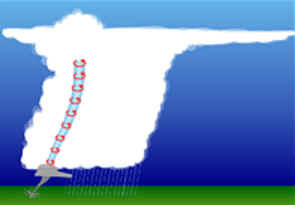 Tornadoes can also happen at any time of day, but most tornadoes occur between 4-9 p.m.
A tornado is a violently rotating column of air extending from a thunderstorm to the ground. Tornadoes cause an average of 70 fatalities and 1,500 injuries in the U.S. each year.. The strongest tornadoes have rotating winds of more than 250 mph. Tornadoes can be one mile wide and stay on the ground over 50 miles. The average forward speed is 30 mph but may vary from nearly stationary to 70 mph. 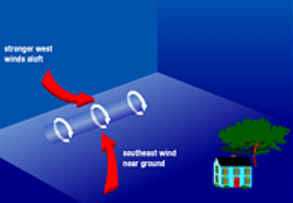 Waterspouts are tornadoes which form over warm water. They can move onshore and cause damage to coastal areas. During the spring in the Central Plains, thunderstorms frequently develop along a "dryline," which separates very warm, moist air to the east from hot, dry air to the west. Tornado-producing thunderstorms mayform as the dryline moves east during the afternoon hours. Along the front range of the Rocky Mountains, in the Texas panhandle, and in the southern High Plains, thunderstorms frequently form as air near the ground flows "upslope" toward higher terrain. If other favorableconditions exist, these thunderstorms can produce tornadoes. Tornado Alley is a nickname for an area that consistently experiences a high frequency of tornadoes each year. The area that has the most strong and violent tornadoes includes eastern SD, NE, KS, OK. Northern TX, and eastern Colorado. The relatively flat land in the Great Plains allows cold dry polar air from Canada to meet warm moist tropical air from the Gulf of Mexico. A large number of tornadoes form when these two air masses meet, along a phenomenon known as a "dryline." The dryline is a boundary separating hot, dry air to the west from warm, moist air to the east. You can see it on a weather map by looking for sharp changes in dew point temperatures. Between adjacent weather stations the differences in dew point can vary by as much as 40 degrees or more. The dryline is usually found along the western high plains. Air moving down the eastern slopes of the Rockies warms and dries as it sinks onto the plains, creating a hot, dry, cloud-free zone. During the day, it moves eastward mixing up the warm moist air ahead of it. If there is enough moisture and instability in the warm air, severe storms can form - because the dryline is the "push" the air needs to start moving up! During the evening, the dryline "retreats" and drifts back to the west. The next day the cycle can start all over again, until a larger weather system pushes through and washes it away. 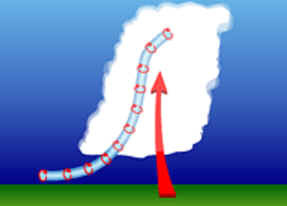 Before thunderstorms develop, a change in wind direction and an increase in wind speed with increasing height creates an invisible, horizontal spinning effect in the lower atmosphere. Rising air within the thunderstorm updraft tilts the rotating air from horizontal to vertical. An area of rotation, 2-6 miles wide, now extends through much of the storm. Most strong and violent tornadoes form within this area of strong rotation. FACT: Violent winds and debris slamminginto buildings cause most structural damage. FACT: Opening windows allows damaging winds to enter the structure. Leave the windows alone; instead, immediately go toa safe place. What does a tornadic storm look like? Forecasters and storm spotters have learned to recognize certain thunderstorm features and structure that make tornado formation more likely. Some of these are visual cues, like the rear-flank downdraft, and others are particular patterns in radar images, like the tornadic vortex signature (TVS). Inflow bands are ragged bands of low cumulus clouds extending from the main storm tower to the southeast or south. The presence of inflow bands suggests that the storm is gathering low-level air from several miles away. If the inflow bands have a spiraling nature to them, it suggests the presence of rotation. The beaver's tail is a smooth, flat cloud band extending from the eastern edge of the rain-free base to the east or northeast. It usually skirts around the southern edge of the precipitation area. It also suggests the presence of rotation. A wall cloud is an isolated cloud lowering attached to the rain-free base of the thunderstorm. The wall cloud is usually to the rear of the visible precipitation area. Wall clouds are about two miles in diameter and mark the area of strongest updraft in the storm. As the storm intensifies, the updraft draws in low-level air from several miles around. Some low-level air is pulled into the updraft from the rain area. This rain-cooled air is very humid; the moisture in the rain-cooled air quickly condenses below the rain-free base to form the wall cloud. A wall cloud that may produce a tornado usually exists for 10-20 minutes before a tornado appears. A wall cloud may also persistently rotate (often visibly), have strong surface winds flowing into it, and may have rapid vertical motion indicated by small cloud elements quickly rising into the rain-free base. The rear flank downdraft is a downward rush of air on the back side of the storm that descends along with the tornado. The RFD looks like a "clear slot" or "bright slot" just to the rear (southwest) of the wall cloud. It can also look like curtains of rain wrapping around the cloud base circulation. Eventually, the tornado and RFD will reach the ground within a few minutes of each other. The RFD causes gusty surface winds that occasionally have embedded downbursts The rear flank downdraft is the motion in the storm that causes the hook echo feature on radar. 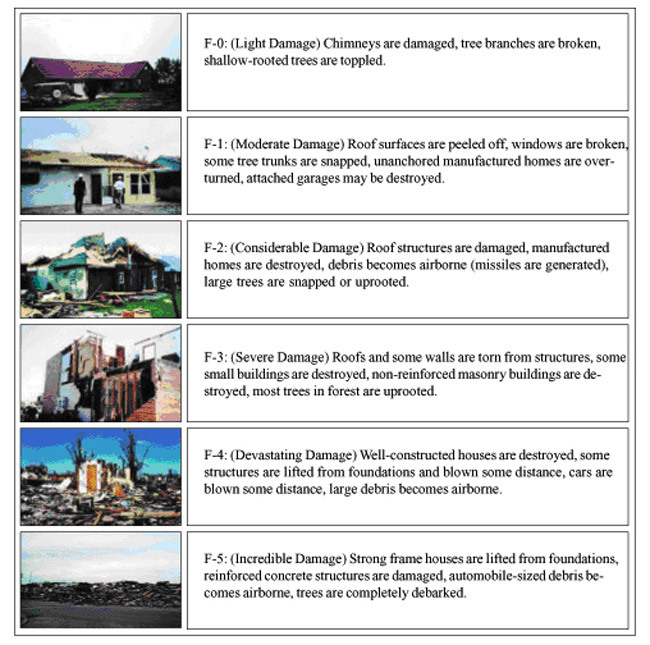 The Fujita Tornado Scale, usually referred to as the F-Scale, classifies tornadoes based on the resulting damage. This scale was developed by Dr. T. Theodore Fujita (University of Chicago) in 1971. If you hear a "Tornado Warning" seek safety immediately. Go to a basement or interior room on the lowest floor (bathroom or closet without windows, under stairs). Get under a sturdy piece of furniture. If you have time, gather prescription medications, wallet and keys. DO NOT open your windows! Find a culvert or cave. Find something to hang onto. Lie flat in a ditch.